At the 3* standard category, the hotel has room for 108 persons structured as follows 3 suites, 1 studio, 8 single rooms with shower, 19 twin rooms and 27 matrimonial suites. 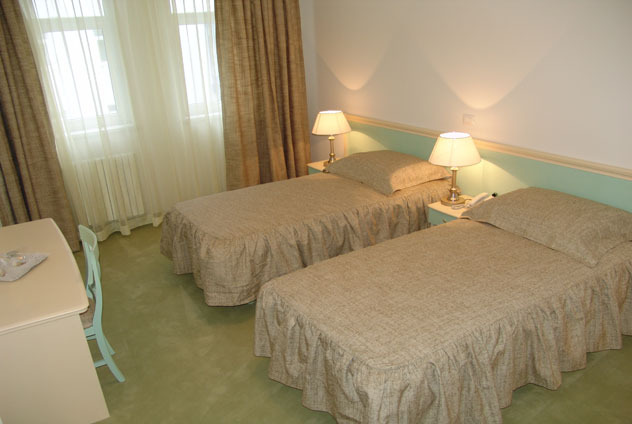 The rooms are equiped with bathrooms air conditioning, cable tv, wireless internet, a fridge and a phone. Starting with December of 2008 a new 3* superior wing was opened. We are waiting to accommodate you in the new 4 studios, 11 twin rooms and 12 matrimonial suites, placed on three floors, each floor beeing decorated and furnitured in different colours. *The rates include all the local taxes, VAT and breakfast with Swedish buffet. The rooms are equipped, for your added comfort, with air conditioning, cable Tv, wireless internet, minibar, hair drier, a vault, a bath robe and house slippers, and smoke detectors. Room access is secured and it's made using a magnettic card. The accommodation facility owns a luggage kepping space, secured parking spaces in front of the hotel, and non the last the underground parking spaces.